St. Petersburg police have re-opened the case of the shooting death in 1982 of a Brinks guard. ST. PETERSBURG – Brinks is offering a $10,000 reward for information leading to an arrest in a 35-year-old cold case recently re-opened by the St. Petersburg Police Department’s new cold case squad. On Jan. 23, 1982, two men dressed as “Miami Elevator” repairmen and pretended to be working on the elevators at Robinson’s Department store at Tyrone Square Mall about the time a Brinks armored truck was scheduled to make a pick up. Shortly after 3 p.m., as Brinks’ employee Joseph Warner was opening the door to leave the store with a deposit bag, the two men confronted him and shot him once. Warner, of Tampa, died from the gunshot wound. He was a 22-year military veteran who had worked for Brinks for seven years. Warner left behind a wife and five school-aged boys. The getaway van, stolen from the Orlando area, was dumped at the Jungle Prada boat ramp, where the suspects boarded a rented boat. A fraudulent Canadian license was used to rent the boat. Ironically, police said, they used the identity of a Canadian beat cop. When they realized the deposit bag contained no cash – only non-negotiable checks – they threw it overboard near Madeira Beach Elementary. Then they abandoned the boat near the Clearwater Causeway. This case received widespread attention and was profiled on the television show America’s Most Wanted. The suspects were described as two white men, one in his late 20’s and one in his 40’s (50’s and 70’s now). One witness described them as “handsome.” While investigators pursued several suspects over the years, none panned out. The St. Petersburg Police cold case squad recently re-opened the case, and officers said DNA developments have moved the case forward significantly. 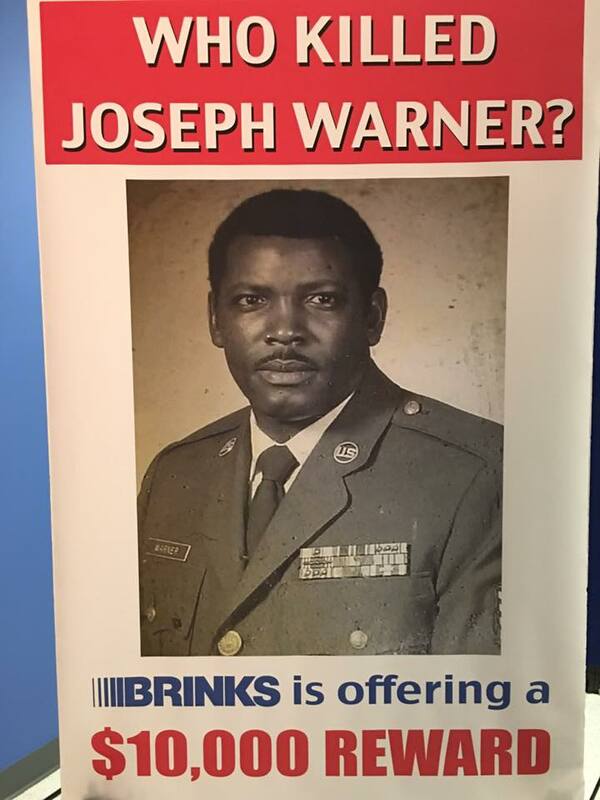 Brinks has already helped with advancing the investigation, and now is offering a $10,000 reward for information leading to the arrest of a person or persons in the murder of Mr. Warner. Anyone with information please call (727) 893-7780 or text SPPD + tip to TIP411. For information about the case, go to facebook.com.